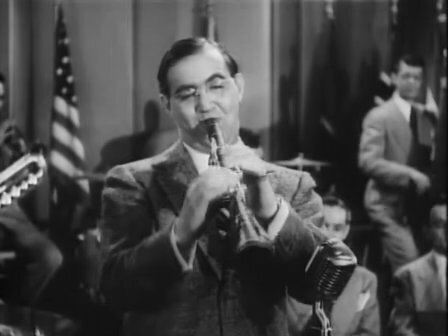 Benny Goodman was popularly known as "King of Swing", "The Professor" and "Patriarch of the Clarinet". His most popular songs included: "Let's Dance", "Don't Be That Way", "Flying Home", "Memories Of You", "Somebody Stole My Gal", "Clarinet a la King", "Jersey Bounce","Why Don't You Do Right? ", "After You've Gone", "Stompin' At The Savoy", "Sing, Sing, Sing", "Symphony", "Liza (All The Clouds'll Roll Away)", "How Am I To Know? ", and "Goodbye". Benny Goodman playing his clarinet. A cropped screenshot taken from the film, Stage Door Canteen (1943). 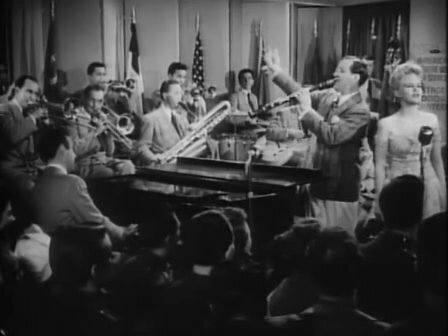 Benny Goodman conducting his band. Another cropped screenshot from the film, Stage Door Canteen (1943). 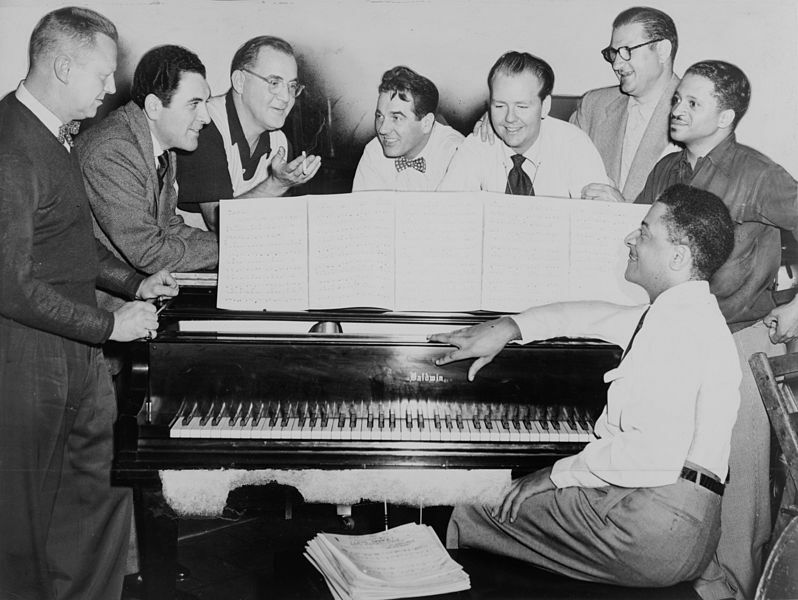 Benny Goodman (third from left) with some of his former musicians, seated around piano left to right: Vernon Brown, George Auld, Gene Krupa, Clint Neagley, Ziggy Elman, Israel Crosby and Teddy Wilson (at piano). Photo: World Telegram & Sun (photographer: Fred Palumbo). Note: This picture gallery page includes drawings, paintings, photos and images of performances of Benny Goodman.